April 1964, but spring hasn’t quite sprung. The bad weather seems suited to nothing but bad news. And bad news is coming to the police station. First, Bordelli’s friend Casimiro, who insists he’s discovered the body of a man in a field above Fiesole. Bordelli races to the scene, but doesn’t find any sign of a corpse. Only a couple of days later, a little girl is found at Villa Ventaglio. She has been strangled, and there is a horrible bite mark on her belly. Then another little girl is found murdered, with the same macabre signature. And meanwhile Casimiro has disappeared without a trace. The investigation marks the start of one of the darkest periods of Bordelli’s life: a nightmare without end, as black as the sky above Florence. 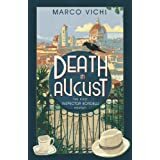 Yes I know I have a gazillion books to read and review, but couldn’t resist reading this, having thoroughly enjoyed Vichi’s debut ‘Death In August’ featuring the wonderfully curmudgeonly Inspector Bordelli and I’m pleased to say that this is the equal of, or indeed even better, than the first book. 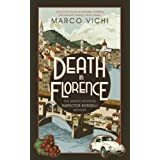 Set in 1960‘s Florence, Vichi once again renders the location and atmosphere of Italy in this period perfectly, with an astute eye on the socio-political backdrop and the lasting shadows cast by Italy’s involvement in World War II, whilst neatly balancing a multi-layered plot of murder and retribution. The pervasive nature of war is most cleverly portrayed by the flashbacks of Bordelli’s own experiences as a member of the San Marco resistance, and throughout the story there are perfectly placed vignettes of his, by turns, harrowing and life affirming, experiences during his service which have shaped to a large degree his sense of morality, tempered by a cynical attitude to the failings of his fellow man. Bordelli is not only seen as a dedicated police officer, but as a man determined to right what he sees as perceived wrongs, equally at home in the presence of his colleagues and members of the criminal classes and always prepared to defend the honour of both. In this multi-layered story, this becomes most evident in his investigation of the murder of Casimiro, a shady informant, but nevertheless a friend of Bordelli, which cleverly incorporates the activities of the White Dove, a post-war organisation investigating the whereabouts of Nazis who have escaped the punishments handed down by the Nuremburg trials. Bordelli finds himself at odds with the White Dove, despite his sympathies, to gain justice for the murder of his friend. Running alongside this arc of the story is Bordelli’s hunt for a child killer with a unique and macabre signature, which again reflects the theme of the inescapable shadows of war and proves to be an extremely testing case for our erstwhile hero. 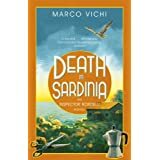 Not only is the plotting razor sharp, but Vichi’s grasp of characterisation is excellent, evident throughout the book as he brings into sharp focus, Bordelli’s complicated relationships and his interaction with his colleagues. As in common in most crime books, Bordelli has little respect for his superiors and forges his own path throughout, aided and abetted by his relationship with the prickly pathologist, Dr Diotivede, and his police partner, Piras. 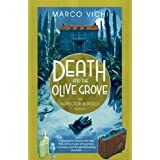 His relationship with his surly Sardinian sidekick, Piras, is a joy, tempered by humour and pathos, and reveals itself as a touching, almost father/son relationship, during the course of the investigation. Bordelli, also has an interesting relationship with Rosa, the epitome of the ‘tart with a heart’ who acts as a sounding board and source of emotional comfort to the beleagured Inspector in his darkest hours, whilst he also embarks on an ill-fated affair with a beauty less than half his age, which brings another facet to his character, and his all too human weakness for the attentions of a pretty girl. Oh, this is a series I’ve heard such good things about and haven’t yet tried. Shame on me ’cause it’s not only an historical series (which I like) but it has such a great protagonist. You’ve a great review here! Among other things it’s kicked me in the pants to ‘meet’ Bordelli. Excellent! Enjoy your meeting with the charming Inspector B!